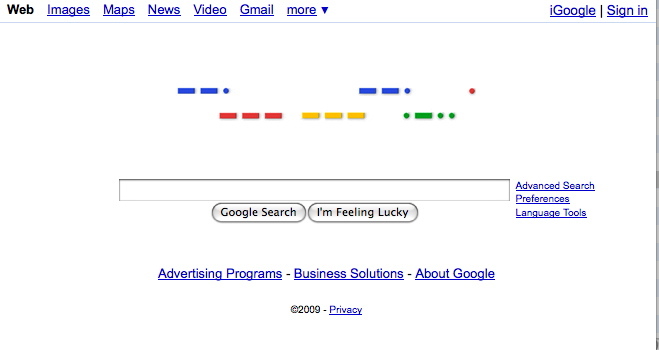 We woke up this morning to find the homepage of search engine, Google, in morse code. What a great way to commemorate Samuel Morse’s birthday. In case you missed this special Google Doodle, check out the screen capture below. Go to the LCWO (Learn CW Online) website, create an account, and start learning morse code online today! If you’re an amateur radio operator or are considering becoming a ham, check out this article. Code practice is easy if you have a code buddy! Click here to read Wikipedia’s biography of Samuel Morse. This entry was posted in News and tagged CW, Google, Google Doodle, Google Morse Code, Morse Code, Samuel Morse on April 27, 2009 by Thomas.